...A rushed, black organza dress from the 50s! The bodice is boned, and the skirt has a stiff linen/horsehair lining and a metal hoop that makes the skirt stand out a bit. I love how the top layer is draped! Found it on Crush Vintage's Etsy page. No matter what you paid it was worth it. This dress is fabulous! Miss Meadows I am absolutely thrilled at how amazing you look here, this dress is just absolutely perfect for you and in my belief you really do rock it, you look absolutely incredible, the sultry black look really suits you although saying that I've never seen you wear a look that doesn't look good so maybe you could wear those outfits that you say you don't want and even rock them, this is my favourite dress though. Din petita figur passar jättefint med tight liv och fluff-fluff! Är du helt, helt, heeelt säker på att du inte snott de röda pupporna av en viss Dorothy från Kansas? What a gorgeous dress!!! A real princess outfit! 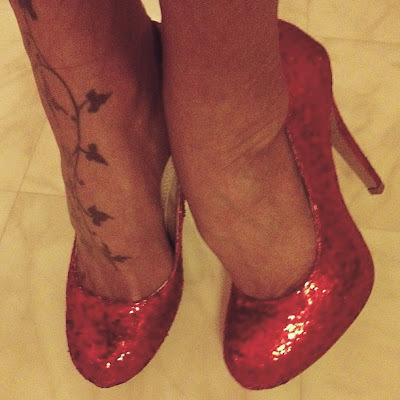 I was looking for red glitter shoes for my Halloween costume (Dorothy from the wizard of Oz) and they were always so pricey, what a pity! You must look for a red glitter purse now!!! It's always easy to find an excuse to buy more vintage stuffs!